Posted September 5, 2018 by finnfemme & filed under Beauty, Daily Life, Fashion, Vintage. 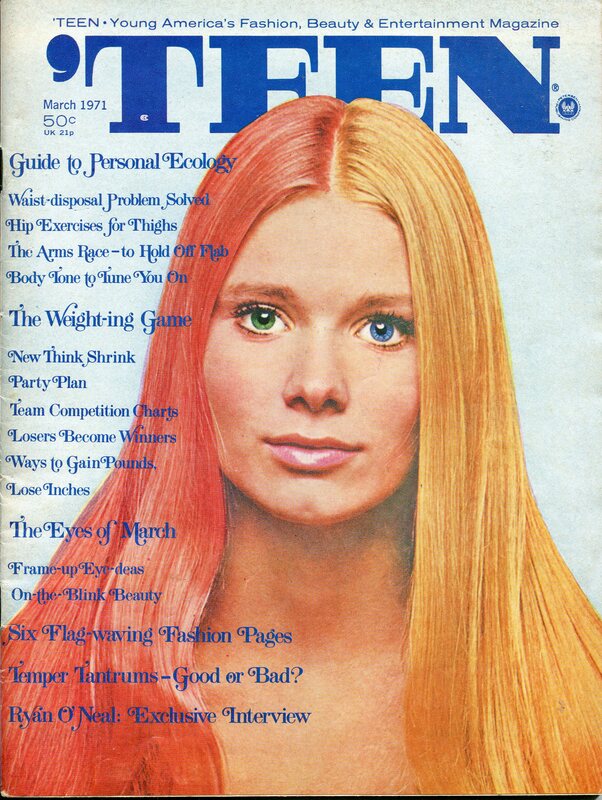 This is one of the most notorious ‘Teen magazine covers, which today seems rather quaint. Featuring Bonnie as the model – apparently last names were not used – for a “split personality” look. Did ‘TEEN really split Bonnie’s look? No. It was achieved through a “complicated retouching process” by professional photographers, with the technology that was available at the time. It is a striking photo, however; one that has stayed in my memory since I first got the issue in 1971. Posted September 3, 2018 by finnfemme & filed under Daily Life, Fashion, Vintage. 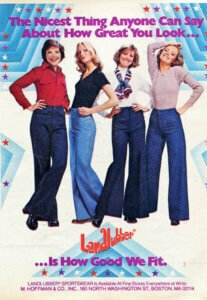 This is a great Landlubber ad that shows just how huge jeans were in 1975. I mean literally huge! Very wide-legged all the way down, not just below the knee like bell-bottoms. There was no such thing as lighter-weight stretch denim – as I remember, in the ’70s – so I am sure these jeans were thick 100% cotton. A lot of material and weight. When I run across vintage denim these days, I am struck by how heavy the jeans were. I definitely wore these because that was the style. I was one to keep up with all the trends. Luckily I was tall and thin, so I think they looked okay (of course most things look cute when you’re 19). The trick was to wear a close-fitting top as not to be overwhelmed in sheer volume. I’ve reversed this style since then. Today I prefer skinny/slim jeans with a looser style top. It’s all about balance! Posted August 27, 2018 by finnfemme & filed under Daily Life, Fashion, Vintage. The iconic Frye Boot, as we know it, made its fashion debut in 1975. Super chunky and sturdy, it fit right in with the mid-70s earthy ‘back to the land’ vibe. The collegiate-style Campus Boot became an all-American symbol of rebellion and freedom. Soon everyone was clunking around in Frye boots, or a reasonable facsimile thereof. Frye boots were benchcrafted exclusively in the USA by John A. Frye Shoe Co., Inc. Marlboro, Massachusetts. A quick look at their website shows that a good number of their classic boots are still made in the USA. They’ve added a trendier line that is made in Italy, which is cool. Nice to see that their classic style and quality still remains! Posted January 17, 2018 by finnfemme & filed under Daily Life, Fashion, Vintage. Crocheting was making a hip and trendy comeback in the 1970s. 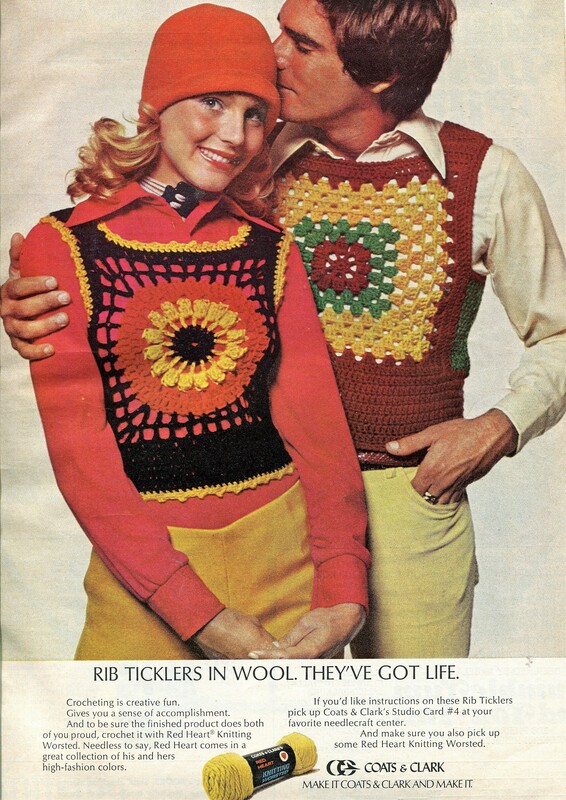 This is a great ad for Coats and Clark wool yarn, which features his and hers “Rib Ticklers” that you could crochet yourself. These tight vests were a granny square/floral design in bright colors. Posted December 20, 2017 by finnfemme & filed under Beauty, Fashion, Vintage. Farrah Fawcett has always had the most incredible hair known to mankind! 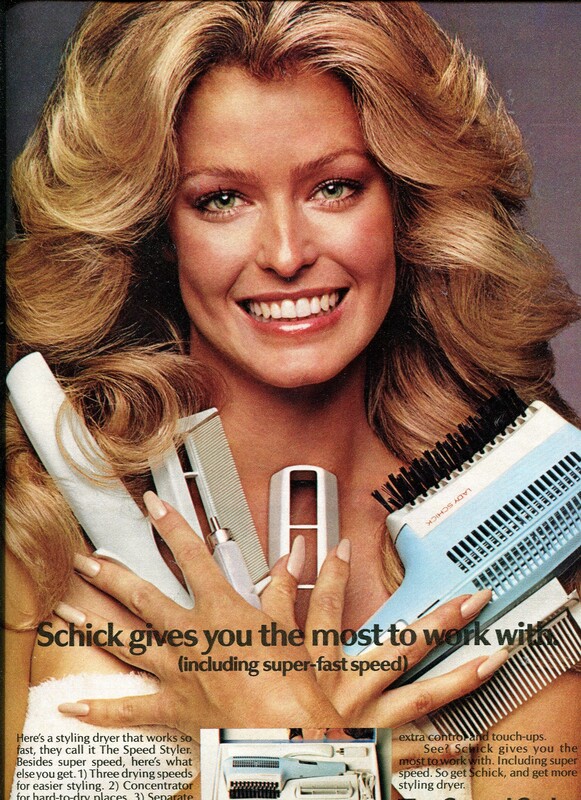 This December 1973 ad for for The Speed Styler by Lady Schick features Farrah who was a relatively unknown model. This was three years before she had the best-selling poster in history (red one-piece bathing suit), and her breakout role as Jill Munroe in Charlie’s Angels in 1976. Farrah’s hairstyle became an international trend, with women sporting a “Farrah-do”, “Farrah-flip”, or simply “Farrah hair” well into the 1980s. Iconic indeed! Posted October 31, 2017 by finnfemme & filed under Beauty, Fashion, Vintage. 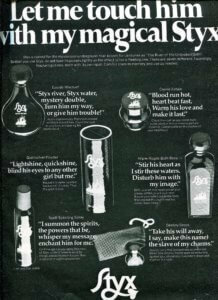 In the late ’60s/early ’70s, there was a certain fascination with all things mysterious. 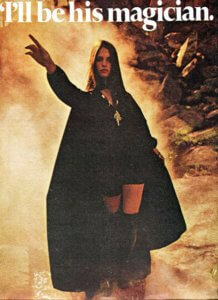 Ouija boards, tarot cards, Dark Shadows, vampires, monsters, and fortune-telling were big. 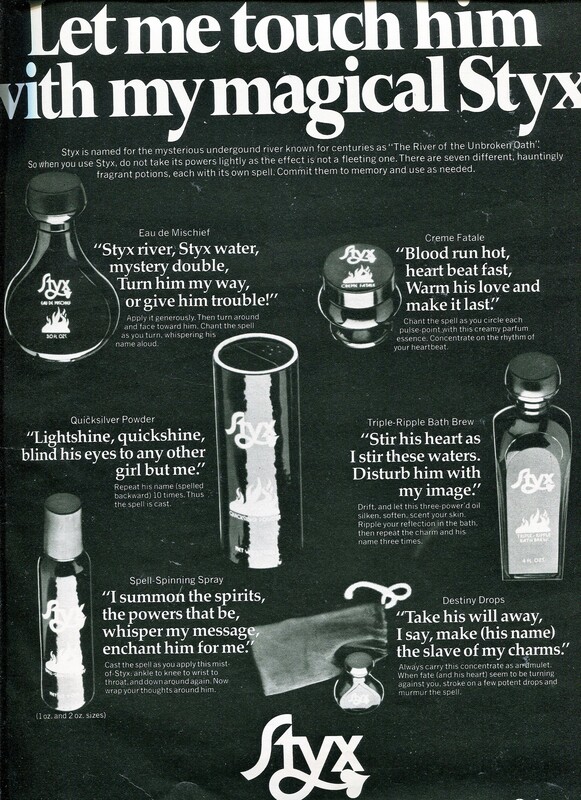 This Styx ad was going along with the trendy zeitgeist of the times.